This heavy-duty 38mm round badge-reel constructed with resistant metal case, strong retractable nylon wire cord and reinforced vinyl strap is meant to be worn in the roughest environments. Its sturdy slide-type belt clip on back ensures a strong attach to your belt, pocket or bag. Retractable nylon cord length: 588 mm. Strong slide-type belt-clip on the back of the reel. 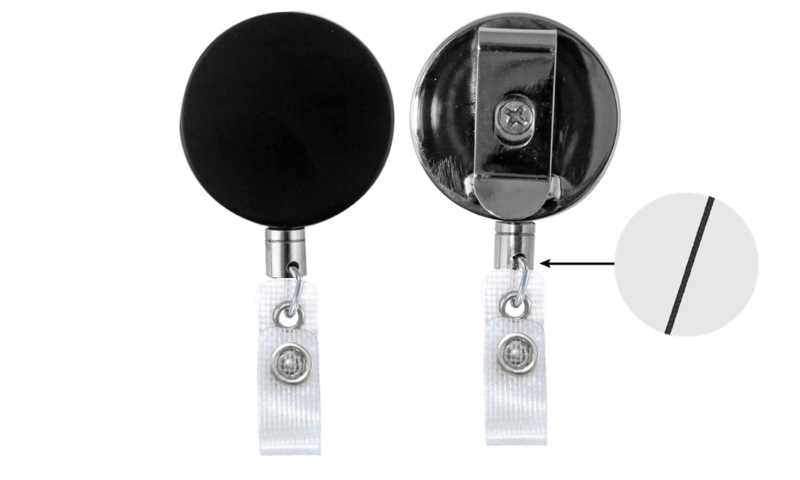 Reinforced vinyl strap (strengthens the vinyl on the clip that attaches to your badge holder or ID badge). Great for applications that require long lasting retractable reel! This heavy-duty badge-reel with front black plastic cover and back chrome case features a durable nylon cord and reinforced vinyl strap. Its sturdy slide-type belt clip on back ensures a strong attach to your belt, pocket or bag.